Comoros (officially called Union of the Comoros) is a small island nation in the Indian Ocean. It is between Madagascar and mainland Africa. 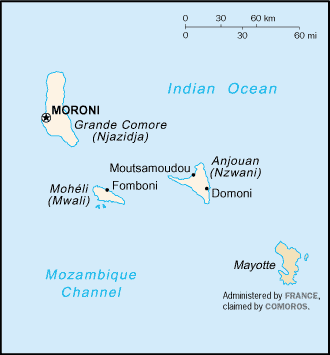 The capital is Moroni on Grande Comore. The population (except for Mayotte) is about 798,000 people. The Comoros Islands are in the Indian Ocean, between Mozambique and Madagascar. It is the southernmost member state of the Arab League. There are 4 islands from west to east: Grande Cormore, Moheli, Anjouan and Mayotte. All the islands are of volcanic origin. Mayotte is French overseas territory. The other islands form the independent state of Comoros. The country has a history with many coup d'état since independence in 1975. As of 2008 about half the people live below the international poverty line of US$1.25 a day. Mount Karthala is the country's highest point. Karthala is an active shield volcano on Grand Cormore. It had a minor eruption in May 2006. The Comoros is formed by Ngazidja (Grande Comore), Mwali (Mohéli) and Nzwani (Anjouan), the three major islands in the Comoros Archipelago. There are also many minor islets. 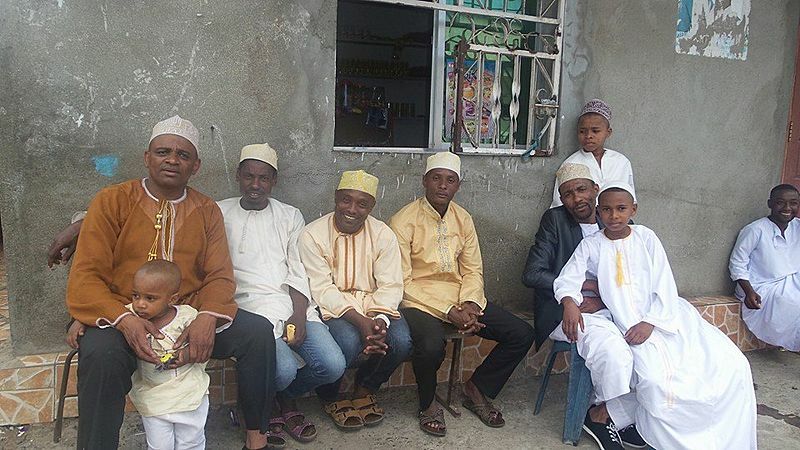 The islands are officially known by their Comorian language names. International sources still use their French names (given in parentheses above). The capital and largest city is Moroni on Ngazidja. At 2,034 km2 (785 sq mi), it is one of the smallest countries in the world. The interiors of the islands vary from steep mountains to low hills. The climate is generally tropical and mild. The rainy season runs from December to April. It is called kashkazi/kaskazi, meaning north monsoon. The cool, dry season is from May to November. It is called kusi, meaning south monsoon. The temperature reaches an average of 29–30 °C (84–86 °F) in March, the hottest month. The average low is 19 °C (66 °F) in the dry season. The islands are rarely subject to cyclones. The islands have their own ecoregion, the Comoros forests. 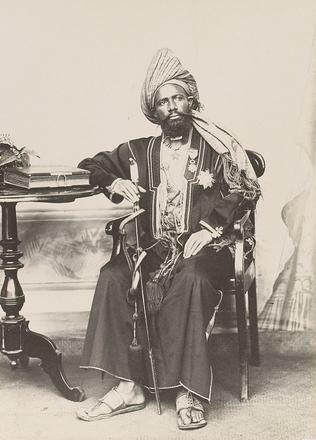 The President of the Comoros is both head of state and head of government. The constitution was adopted on 23 December 2001. It was last amended in May 2009. In November 1975, the Comoros became the 143rd member of the United Nations. The citizens of Mayotte chose to become French citizens and keep their island as a French territory. There is a small standing army. This includes a 500-member police force and a 500-member defense force. A treaty with France provides navy protection for territorial waters. The Comoros is one of the world's poorest countries. Agriculture is the leading sector of the economy. Agriculture includes fishing, hunting, and forestry. The Comoros is the world's largest producer of ylang-ylang. It is a large producer of vanilla. 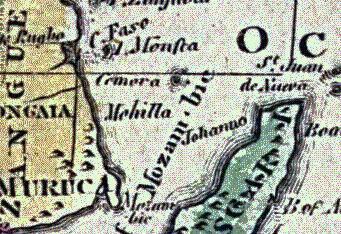 An 1808 map refers to the islands as "Camora". A map of the Comoros. 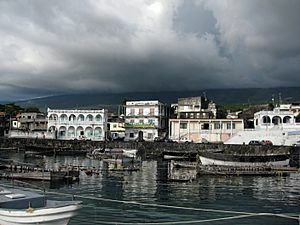 Moroni, capital of the Comoros, with Harbor Bay and Central Mosque. A proportional representation of the Comoros's exports. A view of a coastal town in Anjouan including mosque. Comoros Facts for Kids. Kiddle Encyclopedia.